The New England Journal of Medicine published a work co-written by Professor Andrzej Rynkiewicz, the Head of the Department of Cardiology of the Faculty of Medical Sciences of the UWM. Publishing a research paper in The New England Journal of Medicine is very difficult. It is the most important medical weekly of the world, and scientists from around the world want to publish papers containing results of their research in this general medical weekly with an over 200-year-long tradition. The prestige of the journal is reflected by its very high Impact Factor – almost 56 points. The higher the Impact Factor, the larger of the number of quotes, which is a measure of the impact of a journal in the scientific world. The most important Polish cardiological journal – Kardiologia Polska – has an IF on the level of 0.53 points, and the most important cardiological journal in Europe – European Heart Journal – has an IF that slightly exceeds 15. The article has several co-authors from Europe, the USA, Japan and Australia. 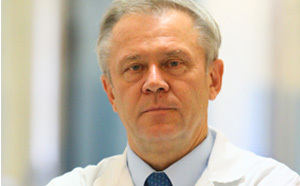 Professor Andrzej Rynkiewicz is one of them. They set up a research team for the purpose of examining takotsubo cardiomyopathy – a disease which has not been fully recognised so far. The publication is a result of their research on a group of 1,750 patients from around the world, which took a few years. - ‘The published results of research specify the characteristics of this disease as well as prognosis and epidemiology. Known also as a “broken heart syndrome”, takotsubo cardiomyopathy leads to acute heart failure and can easily be mistaken for a coronary artery disease or a heart attack. The name of the disease results from the fact that it was described for the first time in Japan. Tako-tsubo means a vessel with a narrow neck and a large bottom, which is used for catching octopuses,’ explains Rynkiewicz. Professor Andrzej Rynkiewicz has collected over 200 IT points for all of his published papers. In The New England Journal of Medicine, however, his name appeared for the first time. ‘It is a scientific success, but it is not only mine. It is the success of the entire Faculty of Medical Sciences of UWM, because the publication is also affiliated with the Department and Clinic of Cardiology of the UWM,‘ he points out.